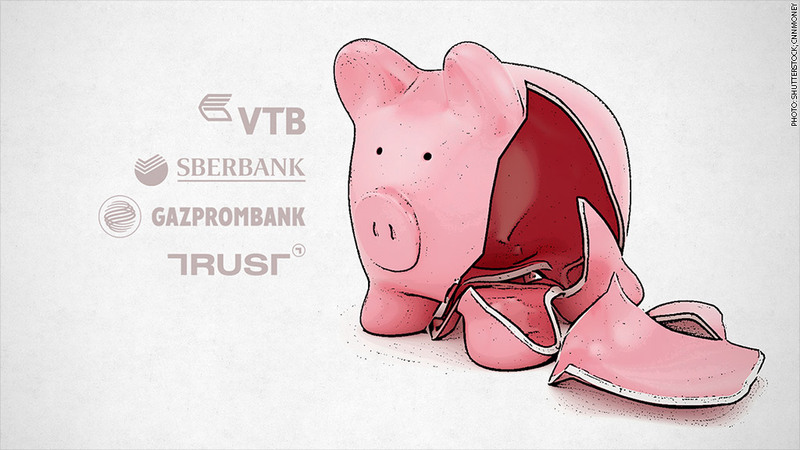 Russia's banks will likely need more government handouts as they battle the country's growing funding crisis. The country's financial sector is under tremendous stress from the plunging value of its currency combined with Western sanctions imposed over Russia's actions in Ukraine. Starved of international funding sources, Russian banks are finding it tough to lend to local companies, threatening to hurt the country's already fragile economy. Last week midsize lender Trust Bank collapsed and authorities rushed to its aid. The Russian central bank will provide up to 99 billion rubles ($1.7 billion) in loans to prop up the institution. It will also lend about $470 million to the bank that is overseeing the bailout of Trust. Finance minister Anton Siluanov said the government would also boost capital to state-owned banks VTB and Gazprombank. VTB is one of the country's biggest lenders. But Russian banks will need even more support. Western sanctions enforced over the Ukraine crisis have cut Russian companies off from European and U.S. funding sources. "Banks need to provide finance to companies that are under sanctions or are unable to go to capital markets," said Sergey Voronenko, associate director at Standard & Poor's. So the banks will demand more help from the government, he said. The rate at which banks lend to each other for short periods, known as the interbank lending rate, has spiked in Russia. Overnight rates are around 18%, which shows that even financial institutions are wary of lending to each other -- intensifying their reliance on government handouts. Voronenko said banks and large corporations will need to refinance to repay almost $100 billion in foreign debt next year. The depreciating ruble is making that extremely difficult. The currency has lost about 40% of its value against the U.S. dollar this year, leading some foreign companies to halt sales of their products in Russia. It's also prompted Russians to pull money out of their bank accounts. Voronenko said there's been "panic-driven deposit outflow" in December and Russia banks could face even tougher and more unpredictable operating conditions in 2015. So far this year the Russian central bank has burned through more than $110 billion in foreign currency reserves to help prop up the ruble. The economy contracted for the first time since 2009 in November and the country - which relies heavily on energy export revenues - is on track for a much sharper slowdown next year if oil prices remain low. Still, Berenberg chief economist Holger Schmieding is confident Russia can prevent a systemic banking crisis even if there is capital flight given current circumstances. He believes the government has the means to recapitalize banks and help companies meet foreign debt obligations. However, he said that to ward off a serious recession, Russia has to act to lift sanctions. "The only thing Russia could do to ease a [deep] recession and to prevent further massive capital flight is to retreat from Ukraine," said Schmieding.